Aiken is a tall left handed pitcher with big upside on the mound. His present fastball sits easily in the low-90s, with good downhill plane. He combines good command of the fastball with a hard spinning upper-70s curveball that flashes plus at times and also shows a promising changeup. 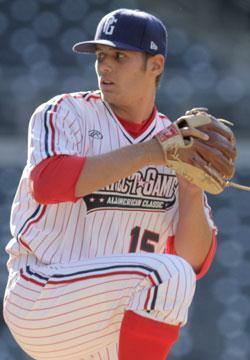 He has the potential for three plus pitches from the left side and is very polished for a high school pitcher. He also swings the bat well and could be a two-way standout at the college level.